Of course there would be some electrical load shedding if the aircraft dispatched with one generator u/s THEN the APU battery failed and THEN the main battery failed and THEN there was an engine failure on the engine with the two good generators, not the one with the generator U/S. Even in this extremely unlikely scenarion where 4 unrelated failures have somehow occurred, there is STILL a 235 Vac variable frequency generator working and a Ram air turbine, or shall we say "yeah but what if they failed too?" or shall we say "yeah but what if they failed too?" Sir, I admire your stout attempts to defend the indefensible. Shall we say "Cascading failure"? Or perhaps "Avalanche effect"
THE EMPEROR'S GOT NO CLOTHES!!!!! so that it is ready for another start in flight at any time. I continue to be puzzled as the why the APU battery must remain connected after it has started the APU. From what I have read, the APU Controller is powered by the APU battery only. So should the battery fail, that powers down the APU controller and the APU. I understand this is the scenario that happened with JL8 at BOS (once the APU battery failed, the APU controller and APU shut down). I've been told this is a standard Boeing Commercial Airplanes design philosophy and is not unique to the 787. Boeing employees I have spoken with have explicitly said this is how the 777's APU operates, for example. What worries me about this a/c is its lack of true redundancy. Its all electric so whilst there is plenty of back up generating power, at some stage in a failure situation busbars have to be linked to get a system to work. Hence the potential for contagion. A/c to date have had effectively three separate power souces hydraulic electric pneumatic, these can back each other up through power transfer units etc, which do not lead to contamination. One only has to think of the tremendous care that say New Yorks power system has been arranged and yet a simple failure can lead to its total shutdown. The APU runs for long periods unmonitored, from the flt deck. During turnrounds etc. If it catches fire then clearly it has to shut itself down and fire its fire bottles. On all a/c I have flown this is standard practice. To power the fire bottles in such a situation pwr is needed, from the battery, If the battery fails the unit shuts itself down as it can not carry out this vital action. Understand the necessity for the APU (and indeed for any system) to have monitoring in case of problems but couldn't this be served by incorporating a small PMG in the APU, thus making it independent of any external power requirements? I admire your stout attempts to defend the indefensible. The word Melodrama comes to mind. From your previous posts you appear to have inside information. If what you are saying is true then in a few weeks time when it appears the 787 will be flying again lots of people's lives will be in serious danger. Therefore the responsible thing for you to do would be to make a, well reasoned cause and effect type augument based on sound engineering principles. Click on the persons name for their testimony. I listened to the first two hours and the 787 never came up beyond the opening statements by the FAA and NTSB heads. The Senators were mostly carping to the FAA head about cuts to contract staff in towers at airports in their state due to the Sequester and then later offered their opinions that current rules banning the use of personal electronics on planes was stupid. Last edited by Kiskaloo; 17th Apr 2013 at 00:57. @cool guys..... No inside info, just old,cynical and been round the block more than a few times. I have spent time with arrogant, concieted ,smartassed "Suits" who are full of crapand their own self-importance. The fact that there was not a major aerial conflagration is sheer luck and casts grave doubts about just how a certificate of airworthiness could be issued for something, which rapidly proved itself unable to meet those standards. Eh? What? politics, big business and unemployment?....they have NO place in air-safety decisions. Until Honest, open, full and frank disclosure is made, I treat any utterance by a Boeing mouthpiece, with the contempt it deserves. These PR- types are paid a handsome wage for their ability to manipulate,distort, obfuscate and sidetrack any uncomfortable truths. The deafening silences, half-truths (omission of any dialogue regarding control-panel issues, failure to honour their commitment to the authorities when consulting with Yuasa)....Get the picture? you can be bloody sure they won't walk away with empty pockets. THAT's what upsets me! Many far-better qualified engineers than I, have pointed -out major deficiencies in the design and build of fundamental safety-attributes of this aircraft. Surely you can understand the frustrations of this group, seeing the apparent cover-up, deceit and sharp-practices that are going on? You REALLY expect us to believe it's not? Another bombastic windbag with nothing but a keyboard and too much time on their hand. "it's been done on here already"
"experts on here have already demonstrated"
Erm no it hasn't. All there is on here is a load of views and theories from random people who can post what they want as long as they have a way of accessing the internet. It's not a forum of experts, it's just a place for people, anybody at all, to talk about stuff to do with aviation. There seems to be people that think that because something is posted online it somehow has an increased likely hood of being correct. back to the battery, I was a little surprised to figure out that the containment was per cell. That means 50 fasteners for each cell times 8 cells. I havent seen if there is another box that this all fits in, but I am sure that is interesting. Is this for the new, improved battery? If so can you provide a link to the description you are working from? 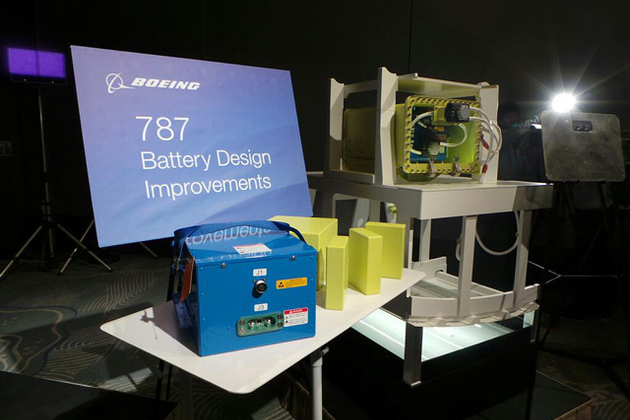 I have been unable to find anything more recent than the original Boeing graphics of the redesigned battery and more helpful photos of the overall containment box. No. I think it's just camera perspective. What impact will these changes have on Maintenance times ?